Back in my time as an undergraduate one of the things I learned about was “sinking funds”. These were repayment schedules for the national debt, structured in the same way as a mortgage, such that not just the debt interest but the debt principle was repaid. The debt was extenguished. Sometime in the 1980s we seemed to stop this and instead now of retiring the debt when it matures we simply roll it over. This was the conversion, if you want to think of it, of the economy mortgage from a regular to an interest only affair. Ireland couldnt issue perpetuities at the low rates of the USA and UK. We cant issue any bonds at present. But we should resolve to do two things when we do go back into the markets. First, we should issue long dated bonds at any opportunity when the long bond yield is below the maturity adjusted rate on the debt. There were period recently when this might have been feasible. Second, we should reintroduce the good old fashioned approach of establishing sinking funds, setting aside not just interest but repayment of principle costs also. 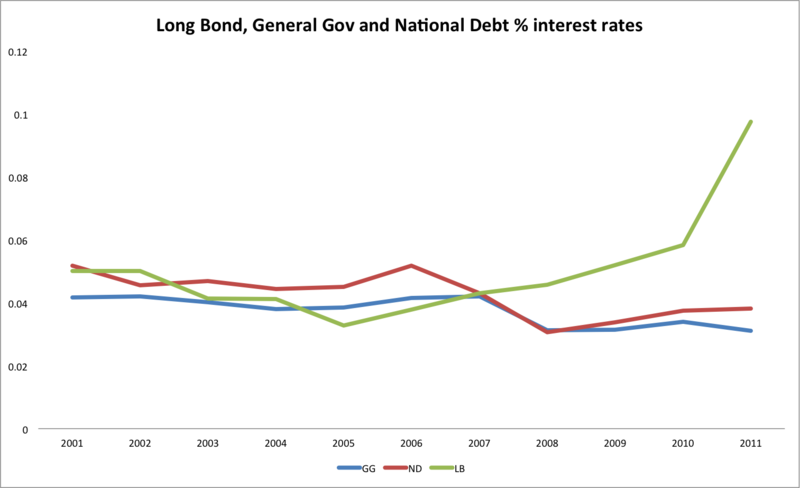 This entry was posted in Blogpost and tagged economics, national debt on January 31, 2013 by brianmlucey. Pretending to be an economist- not really such a bad thing? | Irish Business Blog A post on what it means to be an economist. .. This entry was posted in Blogpost and tagged economics on January 30, 2013 by brianmlucey. So apparently the priceless manuscript heritage of the Sahel, preserved over the best part of a millenium in Timbuktu has been incinerated by the Malian rebels. This is both a tragedy for the region, another example of the wild intolerance of the Salifis towards , well, anything that reeks of “other”, and a crime against culture. While not torching the past the flowers of islam destroyed the tombs of Sufi saints, some also cultural treasures. It is one of the greatest ways to sow despair amongst your enemies, to destroy their heritage and make them rootless in the present by destroying the past. Of course this isnt new. The destruction of the Buddhas of Bamiam made headlines, and as we speak the Saudi government is engaging in monumental building works right in the heart of historic mecca. But, its not just maniacal jihadists with unkempt facial hair in far away regions that do this sort of thing. Europeans and Americans are pretty good at it also. A hundred years ago the German army burned the library of the university of Louvain, with a loss of incalculable proportions to europes medieval heriatage. The german bibliopyranic tendencies came again in WW2 when among other the library of the university of naples and Metz. A list of libraries and archives lost in the 20th century is here and it makes heartbreaking reading. The Americans cheerfully bombed the hell out of Pisa, damaging the Campo Dei Miracoli including the destruction of the frescos of the Campo Santo. They followed that up with the destruction of Monte Cassino; the grandsons of the pilots probably were some of the people who watched slack jawed as “stuff happens” and the priceless collections of the Iraqi museum were looted (while making sure that the oil and gas charts in the museum of petroleum were preserved). the destruction of the built and intellectual heritage of Bosnia was a war crime no less than the mass rapes and starvations. And of course then we have our own fair land – anyone wanting to weep should read the two magnificent books Abandoned Mansions of Ireland (2 vols) and Lost Houses of Ireland and read how many were torched, usually for local petty unmilitary generational revenge reasons, by the IRA in the 1920s. To cap it all we saw the birth of the state on the pyre of history as the four courts burned. Mined by one side, shelled by another, the loss of documents all but obliterated the medieval and early modern records. Well done. So, lets pursue and punish the gibbering fanatics who torched the libraries in Mali. But lets not be too proud – our grandads did the same and guess what? Our grandkids will do likewise. This entry was posted in Blogpost and tagged culture, vadalism on January 28, 2013 by brianmlucey. So now what, as ECB give two fingers to Ireland? Well, I hate to say it but I told you so, many times. The ECB have basically told the Irish government to PFO, in it’s desire to seek a reduction in the cost of the wretched Anglo prom notes. It’s a straightforward no. No reduction in terms, no reduction in interest rates. A smart government would respond with a statement that they were NOT going to pay, and defy the ECB. Instead a spokesperson for the dept declined to comment. This entry was posted in Blogpost and tagged Anglo, ECB, Pfo on January 26, 2013 by brianmlucey. Are MOOCs the future for the Irish Higher Education Sector? Over the last decade or more the language of management has permeated more and more into higher education. For some this is the trump of doom, as they see the accompanying managerialism as being the death knell of the university. Others, myself included, take this with a grain of salt. Universities, indeed all higher education, consists of large complex organizations dealing with tens of thousands of individuals and hundreds of millions of euro. The principles of good management are pretty much universal. Whether one is the abbot of a trappist monastery, the provost of Trinity College, the CEO of a coffee chain, work needs to be organized, finances managed, and the needs and aspirations of those who hold (or perceive that they hold) a stake in the continued success of the organization need to be managed. The differences emerge primarily from the different objectives of the organizations that in turn shape the structure of how the organization works. In universities the stakeholders are the staff the students and the society. These have different time horizons over which they see their needs as to be met, and aren’t always able to differentiate the short and long term. Without getting too managerial we can then think of higher education as an industry. It consists of lots of units, some big some small, all of whom compete and cooperate with each other as the task at hand requires. We can and should then look at this industry with cool eyes. That is not to say that a managerial or economic perspective must dominate. Higher education, universities in particular, generate both public and private returns to investment. The public good is hard to quantify, and thus the standard market pricing mechanisms are not fully suited to resource allocation. In other words, the public must, if they wish the public good to be coproduced with the private good, pay for this. The challenge for universities is not to be efficient – that is simply good management and should be automatic. It is to justify to the public who pay for the public good that the usage of the public resources are as efficient as possible. Alas, in the present state of discourse there seems a needed step is to convince the government and the public that there is such a public good produced. So far so meh some may say – this represents no threat, as universities control the certification process, via rigorous checks on the identity and integrity of students and their work. the emergence recently of two initiatives should cause significant concern for Irish higher education. First, we see the emergence at the lower middle end of universities of a refined blended model. A number of US universities are experimenting with allowing students to enroll on MOOCs, to take the courses and pass examinations (under exam conditions) and to carry that credit as part of courses in the same way as a regular student. Crucially, they see the MOOC not as a substitute or an apocalyptic threat but as a marketing tool. They find that students who take a MOOC tend to be enthused to take other non-online courses. The MOOC is a marketing tool. Second, at the top end we see certification emerging – Coursera for examples allows students to achieve certification in courses using a combination of IT and other security features, while EdX allows for students to take an old fashioned examination with certification if desired. Thus the strategic moat that was certification is crumbling: a student can in theory take a self designed structured set of courses from a set of world leading universities and present evidence to employers that they have, for example , reached the MIT level in computer programming or cybernetics or the Harvard level in biology. Where then stands the Irish third level? Employing 23,000 staff (9400 academic….) and reaching 13,000 students it’s a large industry. As of 2011 for all HEA funded institutions, university and IT, only 4000 students, 2%, were engaged in what it terms flexible learning, which includes distance and in service education. Compare this with the USA where 30% of all students take at least one course online. Ireland has a long way to go. Credit based courses where students can take their degrees in their own time at their own pace are a rarity ; most HE institutions are barely visible online; not a single Irish university has or seems to have plans to have a MOOC (although TCD is contemplating one and is hosting a major international symposium on online education in February) ; UCC is developing a major online presence in postgraduate education across a number of areas ; the HEA is understood to be supportive of moves to create a greater online presence while preserving the on campus experience. Thus some movement might reasonably be expected in the near future. While the obvious MOOC , if we want it to act as a shop window for Irish universities, would be one on Irish studies, we should not stop there. Despite the doom that is poured out that we have no university in the top 100, every single Irish university is in the top 5% of the THES rankings. Every one is world class. We have a world-class industry here. Within disciplines we have world-class researchers and teachers, in pretty much ever-single discipline. A MOOC or ten would demonstrate that, to the public and to the wider world. Every international student is an export – lets place ourselves in the world shop window. This entry was posted in Blogpost, Journalism and tagged education, mooc, universities on January 26, 2013 by brianmlucey. The overwhelming desire of government seems to be to somehow stumble across a new <insert techy MNC here> and get loads of jobs. A further point – If someone is given 200k of taxpayers money to do something, I would have hoped that the funder would require a short paragraph in laymans terms outlining what the project is and why it is good science. Transparency is always a good idea. 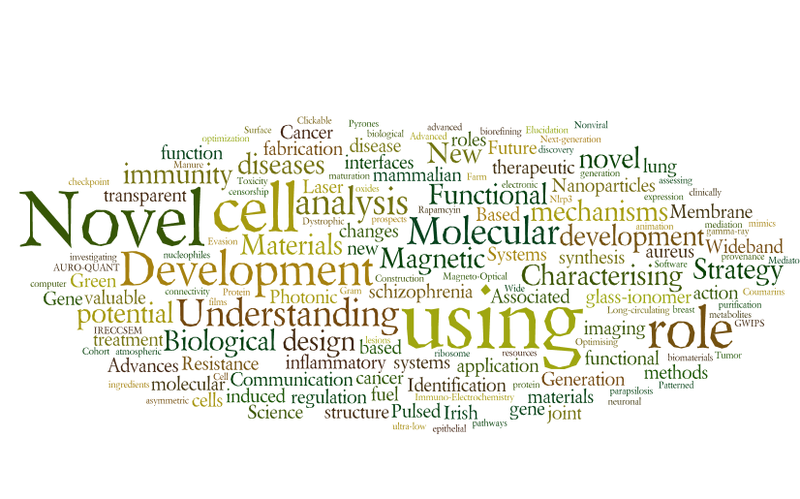 This entry was posted in Blogpost and tagged funding, research, science on January 25, 2013 by brianmlucey.